The one thing he kept referring to was how he could be held accountable for over serving a guest and them hurting someone. "It’s down-right scary" is what he said and then he went on to talk about what happens if you serve a minor. Like he said, there’s a lot to know when serving or selling alcohol and the only way to know the information is to attend a Arizona Title 4 Training Seminar. He asked us how we got into the Business of Alcohol Server Seller Training and I told him that I had worked as a waiter and every other position in the hospitality industry and was at the point in my life that I had to do something else. Yes, I was burned out. The problem was, the only two careers I really ever had was stand-up comedy and waiting on tables. 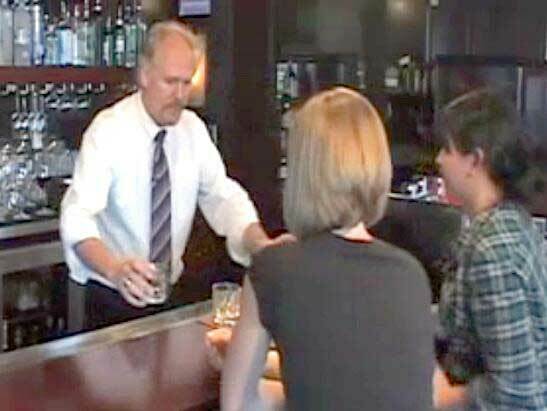 This how I began my career conducting Alcohol Server Training Seminars. My Alcohol Server Permit had just expired and I needed to attend a class to renew my Liquor Serving Permit and while attending the class I was thinking "Why aren’t I conducting the training?" "I have oodles and oodles of experience as a waiter and I don’t have a problem speaking in public, I’m going to look into it." Long story short, here we are 13 years later teaching Alcohol Server / Seller Training online and occasionally we are asked to conduct training on-premise. The server asked me what made our course different than any of the other courses and I told him that we are a lot different than other Alcohol Server Certification Programs. One, our course isn’t boring, it was written through the eyes of a 23 year veteran of serving alcohol in the hospitality industry and I had laced humor throughout the course. I mentioned what a former student of our course said, "When I registered for your course to get my Bartender Permit I had no idea it was going to be like watching a movie that I interacted with." Second, the course is written to be state specific, the information taught in the AZ Alcohol Server Training course is specific to AZ Liquor Laws, from the Dram shop laws to the laws concerning minors to how many drinks a guest can have in front of them. Third, and this is something I figured out a long time ago, "If you control the problems while serving alcohol it is a form of better service and you will make more money…better TIPS. We teach that philosophy in the course and I truly believe in the philosophy. I then complemented him on his Customer (Guest) Service and I wanted him to know how much I appreciated him keeping "Customer (Guest) Service" alive, because through the years I have noticed that not all those who work in the Hospitality Industry, either at a drive through or where they actually "Wait" on the guest "Get" what it means to give great service. Next entry on this blog is going to be about giving better service while serving alcohol and how you can increase your TIPS. Until then, Have a Groovy day! !